Thorough, affordable analysis of your screenplay by smart, professional readers. The ammo you need to bring it to the next level. It’s happened to all of us. We send out a script, and only after the passes come in do we realize the faults in our material. Break the cycle and empower yourself with an industry-leading evaluation from Coverage, Ink before making those crucial submissions. Coverage Ink’s Standard Analysis is the one-stop-shopping, get-it-done solution for screenwriters. We’ll give you a thorough and constructive analysis of your screenplay, teleplay or manuscript, covering all the bases. CI’s standard analyses generally run about 10 to 14 pages (depending on how much there is to say) for feature screenplays and pilots. 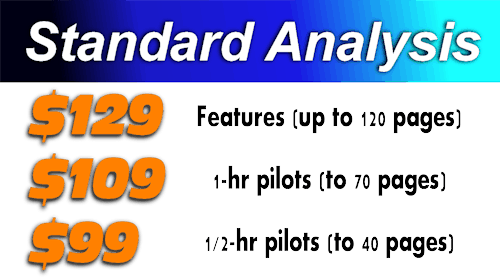 CI standard analysis contains a logline, detailed synopsis (the purpose of which is make sure the reader reads the script a second time to ensure we don’t miss any details,) and then incisive, helpful and constructive notes hitting all the major areas in the screenplay, including Structure, Main Characters, Minor Characters, Dialogue, Pacing, Title, Marketability, Craft and more. Our Standard Analysis is often more detailed than many companies’ “expanded analysis.” And we promise not to tear you down. We won’t pull our punches to be sure, but our goal is to provide solid and inspiring creative feedback, not to humiliate. Standard turnaround time is ten days. We also offer 5-day Semi-Rush turnaround and 48-hour Rush coverage (please call or write to confirm availability before submitting a 2-day rush.) Our team of industry readers have all been tested by us to ensure they know their stuff. We promise a fair and thorough analysis of your script. And we’ll match the genre with an appropriate reader. Want to leave no stone unturned? Go for the CI Double Standard Analysis and have your script covered by two separate story analysis professionals. With two sets of coverage, you can compare and contrast the notes and easily come up with a game plan to improve your script. If the analysts agree, that’s a pretty sure bet that other people will feel the same way. If they contrast, then you can utilize whatever feedback you feel best helps your screenplay. You’ve got one chance to blow their doors off. Make sure your script rocks. CI Standard Analysis is your secret weapon.